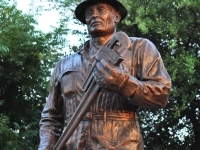 In Memorial Square near downtown Ardmore, Oklahoma The Oil Patch Warrior stands in silent tribute to the energy industry and to the veterans who fought for the American freedom we enjoy today. 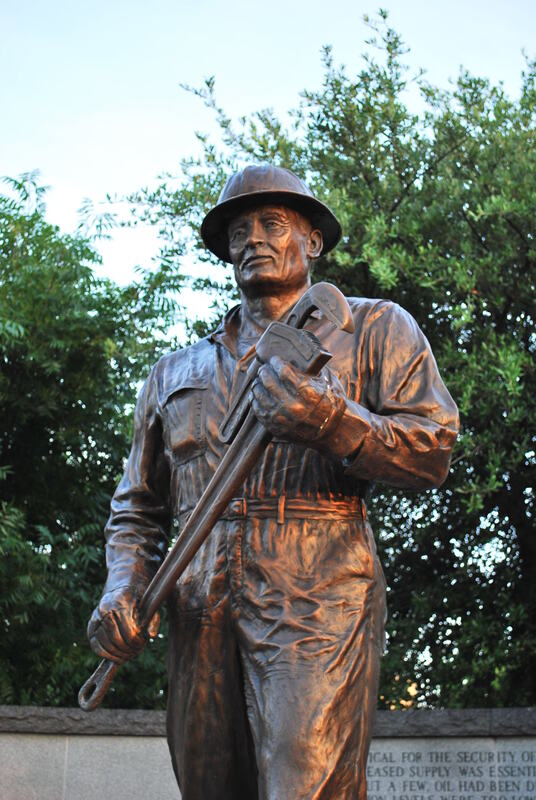 This Ardmore, Oklahoma statue is a replica of a similar statue dedicated in Great Britain in 1991. During World War II, Noble Drilling Corporation – an Ardmore, Oklahoma company – drilled for oil in Great Britain’s Sherwood Forest in order to provide the Brits with a continuing source of energy in the face of Germany’s attempt to cut off oil imports. The brick walkway through Memorial Square displays the name, rank armed forces branch, and years of service of Ardmore area citizens who fought to preserve our way of life. An integral part of Memorial Square is the black granite wall listing the names of those who gave the ultimate sacrifice for their country.